Egypt's 'Rebel' campaign spokesman Mahmoud Badr said Saturday that the initiative to force President Mohamed Morsi out of power had collected over 22 million signatures, surpassing its original goal of 15 million before 30 June. Badr announced that the campaign had gathered 22,134,465 documented signature forms, adding that it had discarded over 100,000 incomplete forms. "The Muslim Brotherhood [from which Morsi hails] is trying to intimidate people from protesting tomorrow by aligning itself with terrorist groups and boasting about being supported by the US," Badr said, referring to the Brotherhood's alliance with a number of other Islamist groups, including hardliners Gamaa Islamiya. On Friday, Islamists in support of Morsi held mass rallies at Rabaa Al-Adawiya Square in Cairo's Nasr City. Opponents of the president also took to the streets, filling Tahrir Square as thousands more protested in Egypt’s different governorates. Islamist parties sponsoring the protests, led by the Muslim Brotherhood's Freedom and Justice Party, then announced they will begin a sit-in at Rabaa Al-Adawiya Square in anticipation of Sunday's protests. 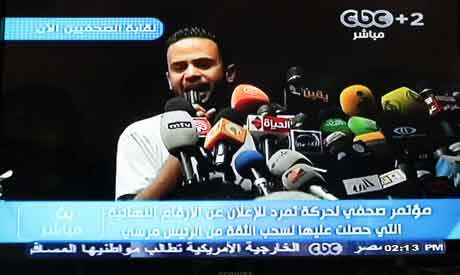 During a news conference at the Journalist Syndicate in downtown Cairo, Badr reaffirmed the campaign's vision for a post-Morsi scenario in which the head of the country's High Constitutional Court would take over power for a period of six months that ends with holding presidential elections. "Morsi has destroyed his own legitimacy even before it was brought down by Egyptians' signatures, after he refused to respect the constitution and preferred the interest of his own group over that of the people," read the 'Rebel' campaign statement released on Saturday. 'Rebel' is one of the main organisers of the widely-anticipated anti-government demonstrations slated for Sunday to demand Morsi's resignation and snap elections. The grassroot campaign, formed in late May, also announced it has planned several gathering points for demonstrations around the governorates, with the main demonstration being in front of the presidential palace in Cairo. President Morsi narrowly won Egypt's first post-Mubarak presidential elections in June 2012, against the latter's last Prime Minister Ahmed Shafiq, with over 13 million votes against around 12 million for Shafiq. The aim of the campaign was to outnumber the amount of votes Morsi had garnered in the presidential elections. The campaign has reiterated its commitment to peaceful protest, following deadly clashes that had intermittently erupted between supporters and opponents of the president over the past three days, raising concerns of violence on Sunday. 22 million woow... Morsi stipulated parliamentary elections to take place in April.. he even changed date for Copts festivals.. by now we would have had a democratically elected MPs from all walks of Egyptian make up. Here you come ...we won mandate from people you claim.. mandate to what ? violence and thuggery ?. Egyptian president is here to remain and clear up corruption and put Egypt for real and ever lasting democracy. Who fears accountability ? tycoons who sit with Egyptian purse looted from systems. Those with legitimate anger must be patient a little longer. changes are in the pipelines. Are those who hold up only the flag of Egypt not the ones with Al-Qaida and Saudi Arabia flags.